What about playing "Accounting Monopoly" using LearnDoubleEntry.org? 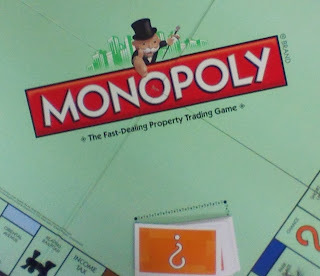 For those who don't know, "Accounting Monopoly" is simply a different way to play the classical Parker Brother's Monopoly game, with some specific rules added in order to force players to keep trace of what's happening, in terms of investments, costs, income, payments, etc. There are some variations in the rules you can apply when playing, but the basic requirement is that players must not use the fake money provided, but use instead only traceable forms of payments (checks, bank transfers, etc.). Some teachers did a great work to prepare instructions, worksheets and forms. You can find some good examples in the works prepared by Carl Lyman, Ingrid Ulstad, Ed Valenski, Travis R. Martin, just to name a few. for all transactions recorded through the bank, a player will be able to see the "bank statement" (ie, the T-Account that the bank holds for the transactions concerning the checking account of the player), realizing that debits and credits are reversed, and doing the necessary bank reconciliation when needed. The students were divided in seven groups, six for the ordinary players and one for the bank. A special, simplified chart of accounts had been prepared (you can use the slug monopoly-player to fork it), and the firms (representing the players) started with that. During the game, students learned how to edit the chart of accounts, how to record a transaction, how to check the ledger, how to make the bank reconciliation, how to prepare the templates for common transactions, how to close the accounts and how to read the financial statements. And they had fun!